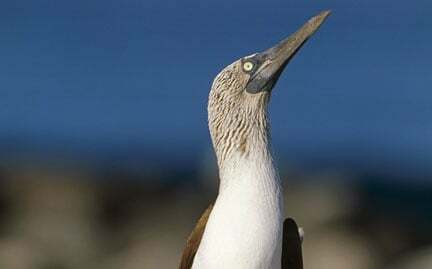 Blue-footed boobies are found on arid, tropical, and subtropical islands off the Pacific coast of South America. Subsisting on a diet of fish, these goose-sized birds can live as long as 17 years and have a wingspan nearly five feet in length. Blue-footed boobies use their vibrant blue feet in a showy mating dance ritual. Habitat loss and egg collecting currently threaten the species.